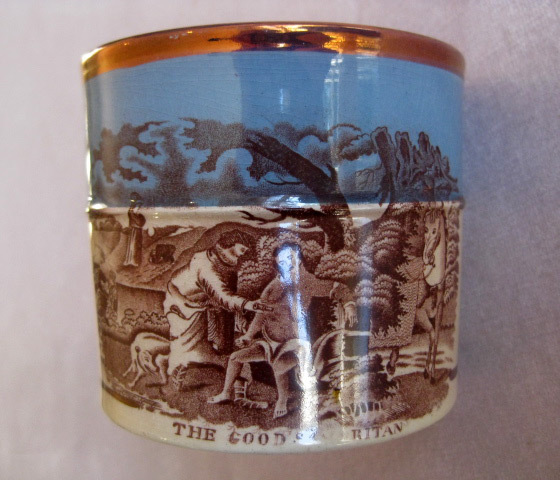 S2196: A Turner smear glazed buff coloured stoneware mug with moulded decoration of a tree, a tree and flowers and the central group with cupids and a sheep. Moulded and banded decoration to the base and with a coffee coloured band around the top. 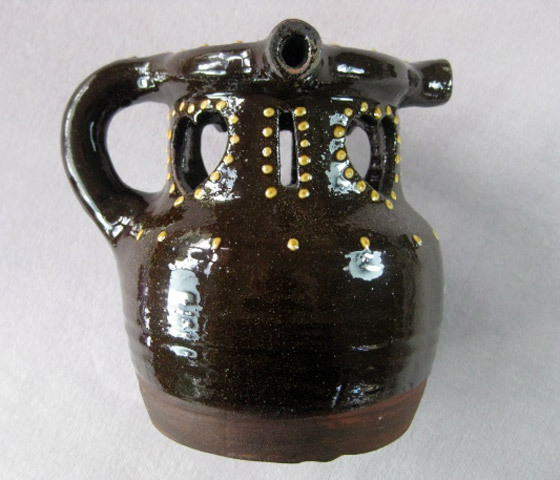 S2579 : A Wrotham style stoneware puzzle jug with a brown glaze from within an inch from the base and with heart and vertical cut out sections to the side and three spouts around the rim. 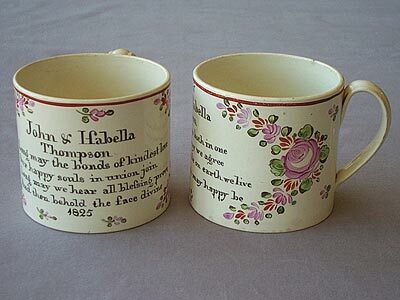 S2203: A very rare pair of creamware marriage mugs each painted with the names John & Isobella Thompson and dated 1825 together with a verse - "the Lord unite us both in one". Floral decoration painted to either side of the verse and names. Brown rim. 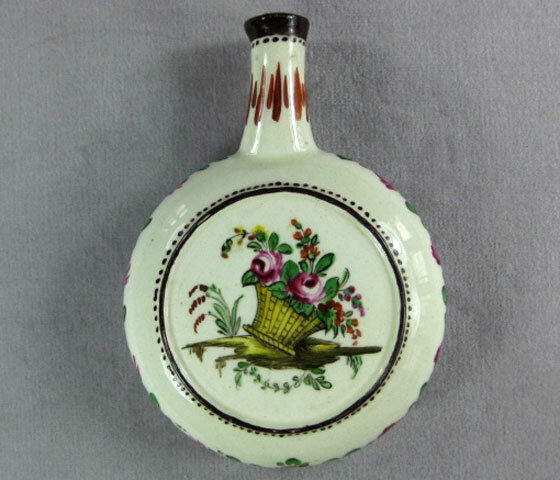 S2631 : A small creamware flask with a central brown rimmed and dotted cartouche to either side decorated with a basket of roses and other flowers and foliage. Further roses and foliage to the sides. 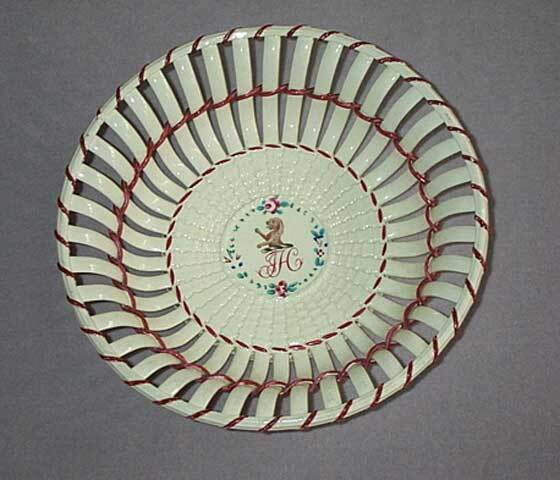 S2301: A fine Creamware basket with plum coloured interlaced sides and top edge. 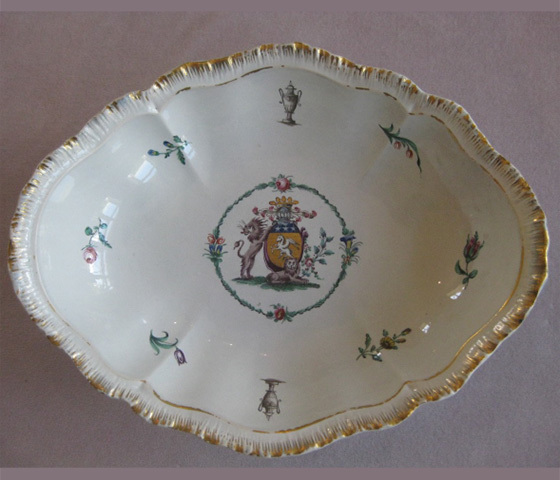 The basket moulded base painted with an heraldic crest of a hound and the initials J.H. within a simple floral cartouche. 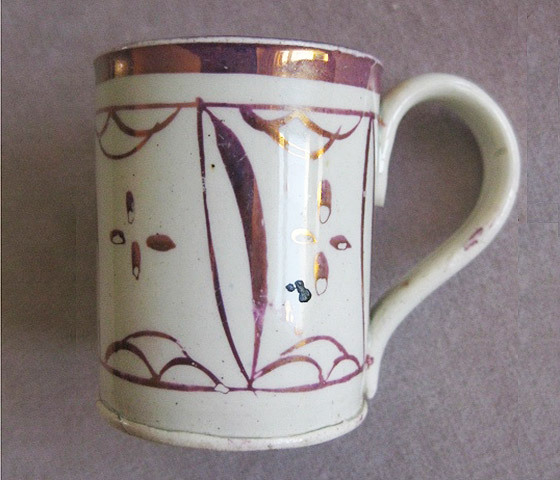 S2830 : A rare pearlware miniature pink lustre ware mug decorated with a simple pattern. S2367: Pearlware Cornucopia Vase. 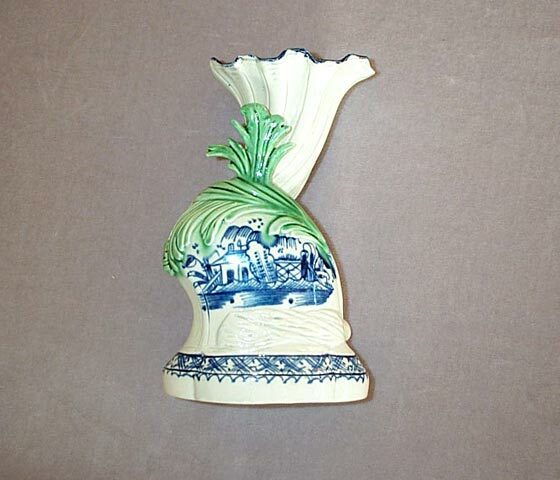 A rare pearlware cornucopia vase decorated with a hatched blue border to the shaped base and a house and garden scene above which is capped by green painted foliage. 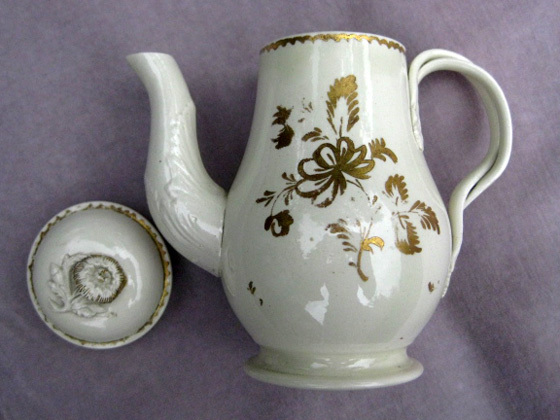 S2485: A fine creamware jug with a shaped top and a double entwined and reeded handle with flower and leaf terminals. 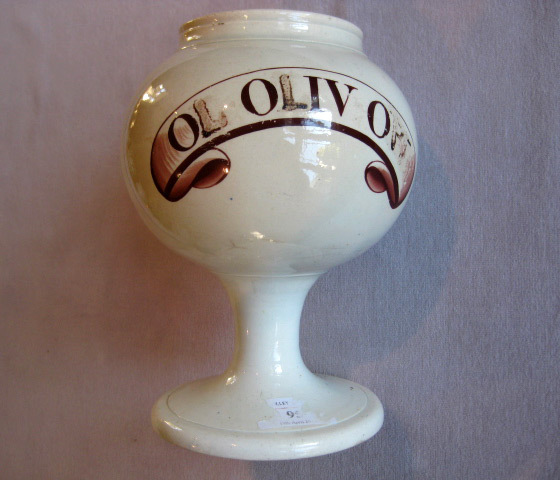 S2562: A fine and rare pearlware Pharmacy oil pot with the name “Ol Oliv Opt” with a scrolled ribbon cartouche. A pedestal foot and a mask head moulded to the underside of the spout. 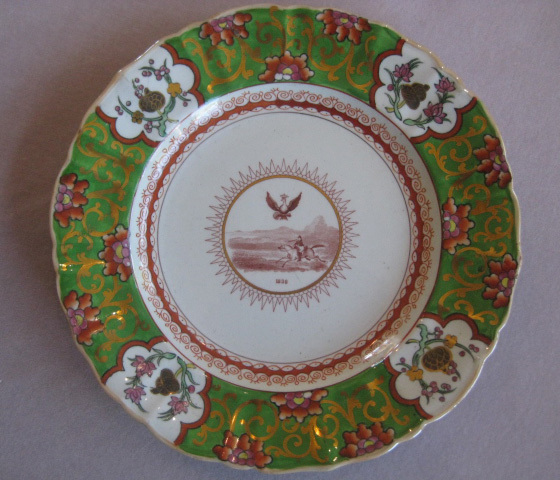 S2563: A Pearlware dish or plaque with a 1” deep rim painted with a brown and stylised floral border. 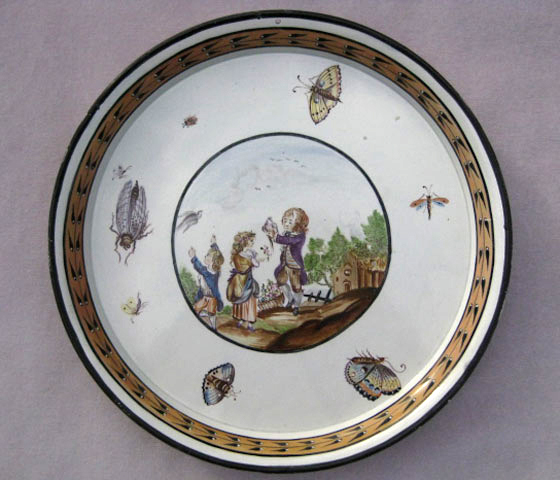 The centre painted with insects surrounding a round cartouche painted with children at play with birds. 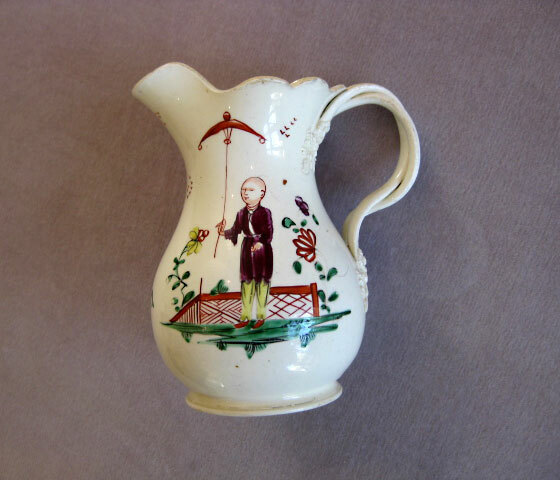 S2678: A creamware jug printed in a brick red to each side with.... an unusual form of the "tea party No 1" and the "Shepherd" .Intertwined strap handles with flower and leaf terminals. 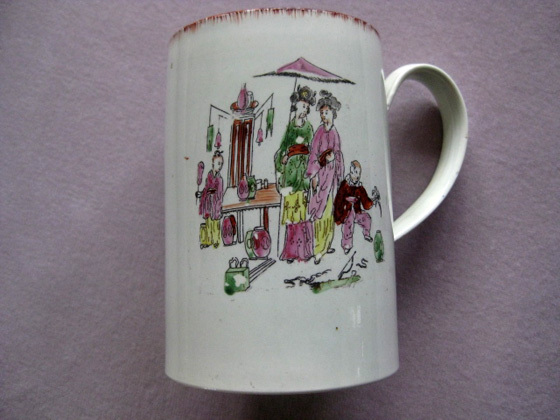 S2777: A fine and rare creamware mug printed with a Chinese family scene to one side and fancy birds amongst foliage to the other and decorated rim. 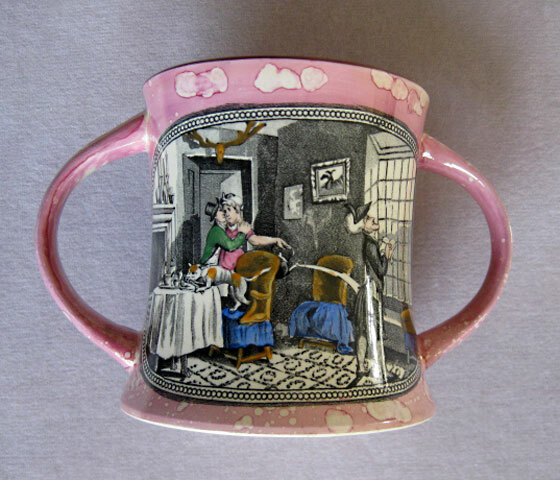 S2508 : A pink lustre loving cup of waisted form and a brown rim. Two coloured prints of Dr Syntax are shown to each side...“Death of Punch” & “ Dr Syntax copying the wit of the window”. 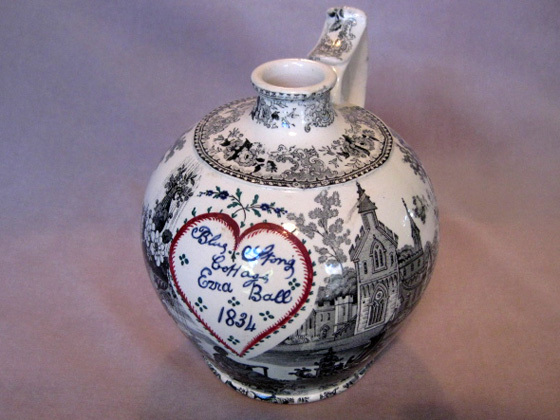 S2404 : A fine and rare William & Adelaide pottery commemorative jug. A puce print shows the coronation ceremony to each side below the words “ William & Adelaide crowned Sept. 8th 1831”. The crest of England, Scotland & Ireland to the inside edge. 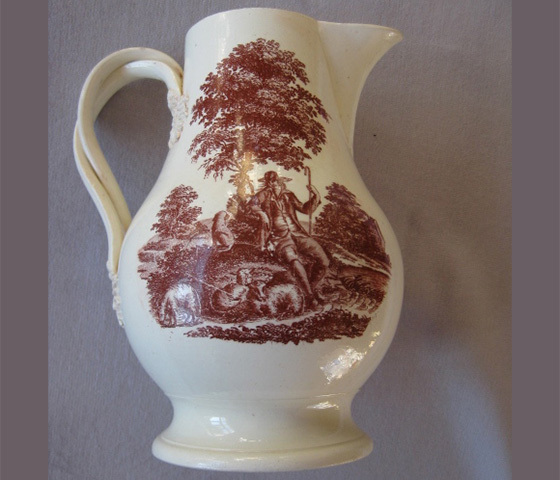 S2407: A pearlware jug with prints to either side. One of Knippels Broe (Bridge) and the other of Fredensborg Castle. 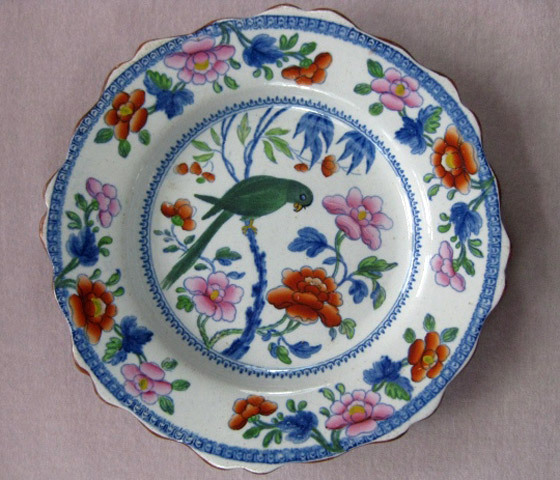 S2951: A pearlware Char dish with printed and painted around the sides. Price Guide : A S2952: A sardine box with a ribbed body and lid and the handle formed as a sardine. 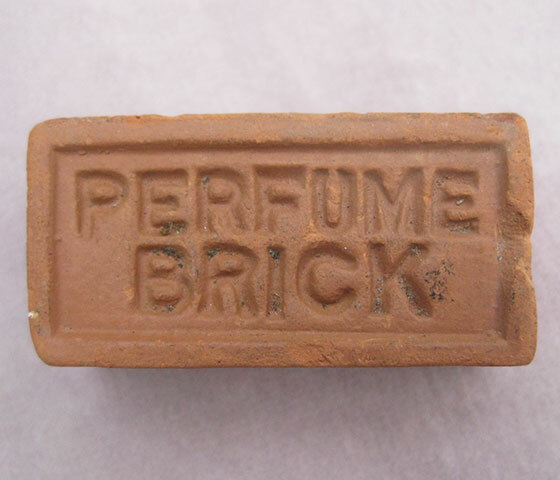 5“ wide and 3 “ high Circa late C 19th. 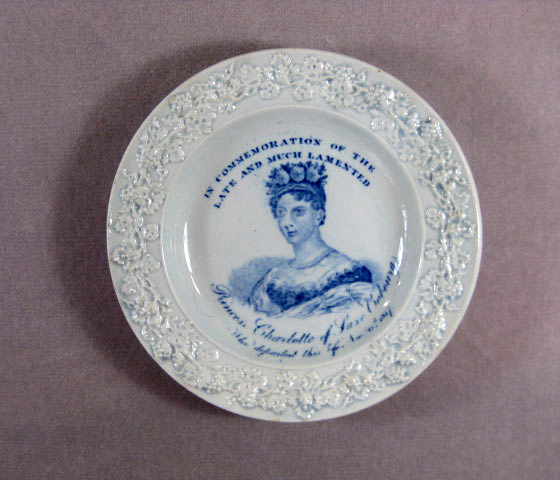 S2560: A fine Pearlware commemorative plate with moulded grapes and vines to the border and with a blue print of Princess Charlotte to the centre. The words “ in commemoration of the late and much lamented Princess Charlotte of Saxe Cobourg who departed this life Nov. 6 th 1817. 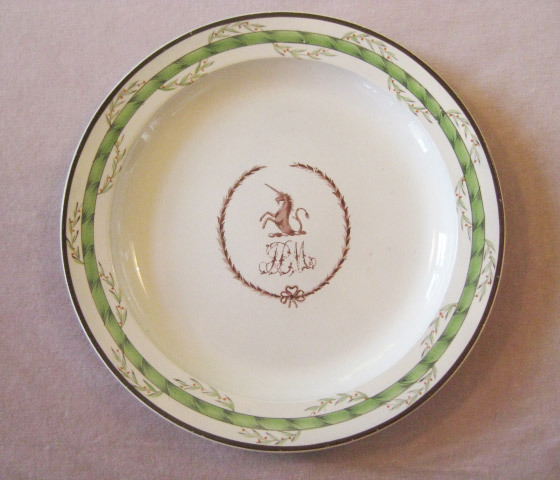 S2797: A fine quality creamware plate, probably Wedgwood decorated with a green band and entwined laurel border. InD 9 3/4” the centre an armorial crest of a unicorn and the initials PBM within a ribboned and leaf cartouche. 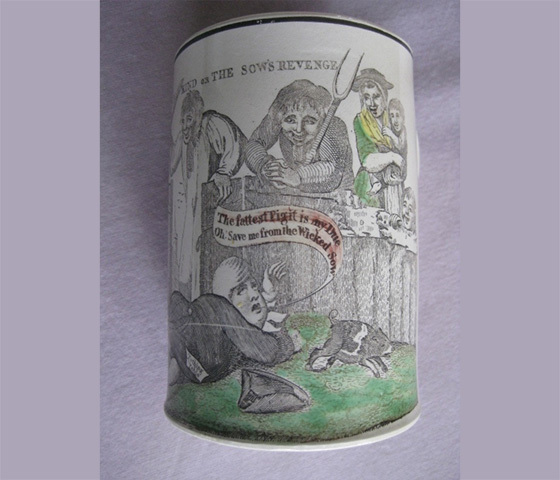 S2709: A rare creamware frog mug printed and coloured with a scene entitled " Tithe in kind or the sow's revenge" related to the Tithe collecting habits of the vicars and the Tithe Pig print. 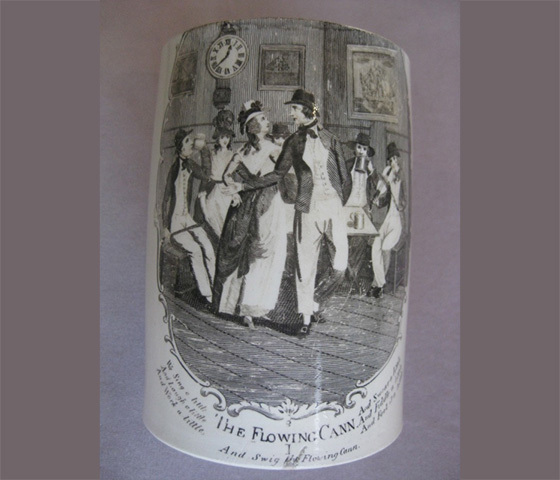 S2732: A creamware mug printed with a scene of a couple dancing inside a pub with other figures seated and a fiddler supplying the music.The Flowing Cann was on sheet music published by Charles Dibdin in 1793. 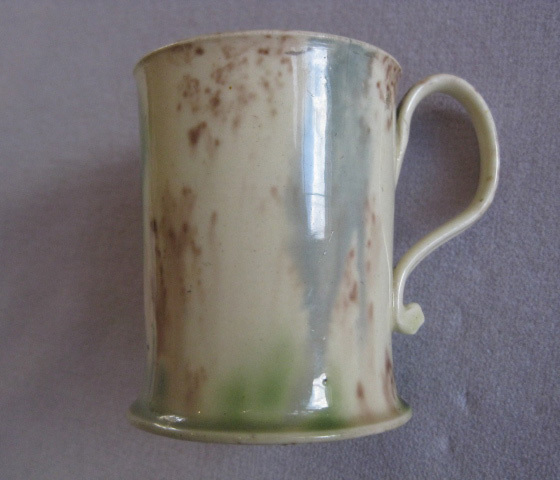 S2733: A delightful small creamware mug streaked with brown ,blue-grey and green in a Whiledon style.Set on a flared base and with a grooved strap handle pinched at the lower terminal. 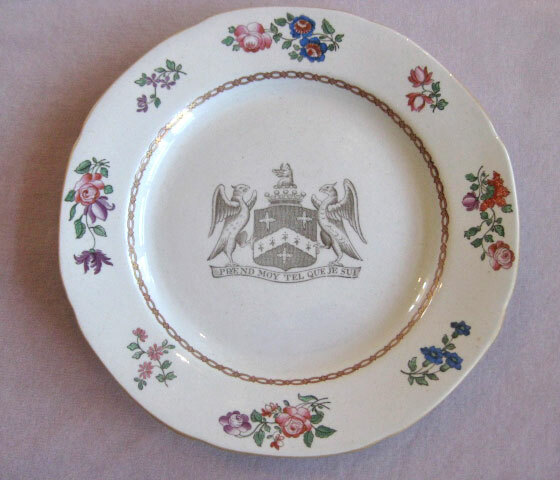 S2739: A Spode New Stone armorial plate decorated by C & G. A brown rim to the edge enclosing scattered floral sprays. 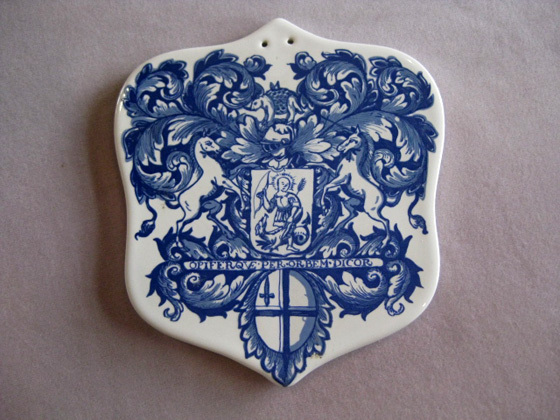 The centre with the coat of arms of the Marquess & Earl of Ely,Viscount & Baron Loftus.The motto Prend Moy Tel Que Je Sui..take me such as I am. 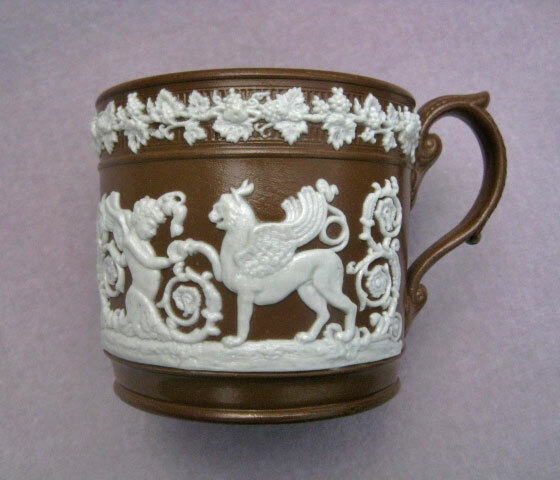 Late Spode Circa 1830 Width 9"
C 100 : A Ridgway brown stoneware mug with sprigged classical decoration in white. S2921: A copper lustre mug with a decorative handle and printed with "The Good Samaratin" print. 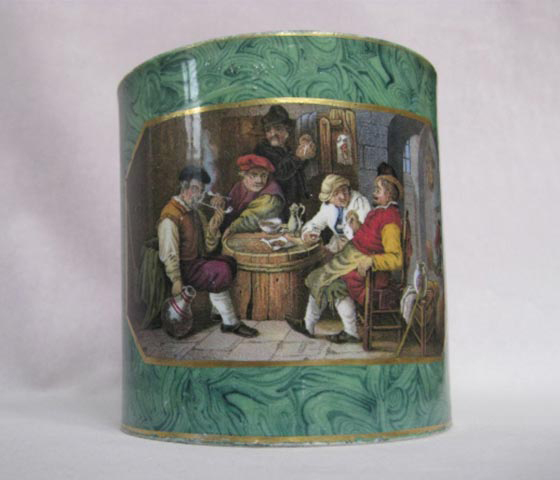 S2927: A Prattware mug with a malachite ground colour and with an irregularly shaped gilt lined octagonal cartouche showing an image "The Jolly Topers". 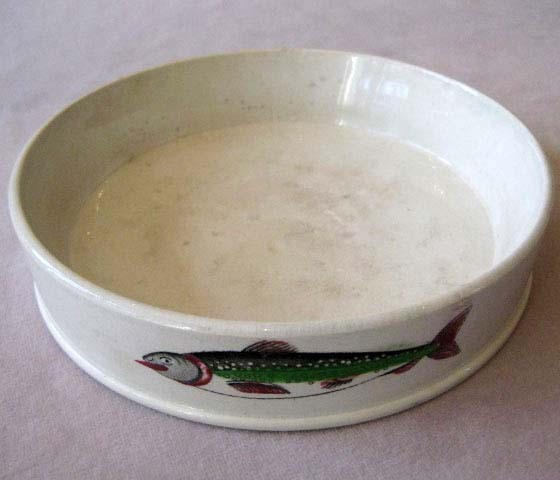 S2763: A glazed stoneware tobacco pot with a tin lid painted cream. 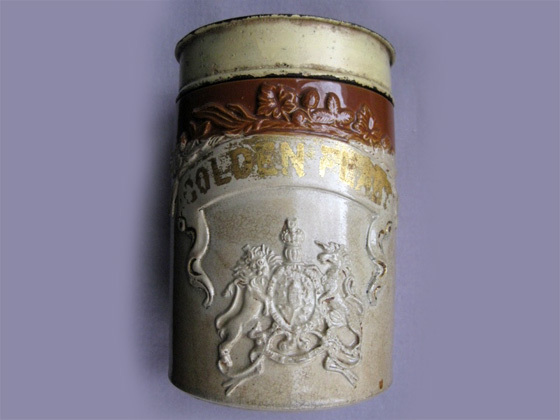 A brown band around the top and inner rim and with floral moulding above a cartouche with GOLDEN FLAKE in gilt with the Royal coat of arms below. 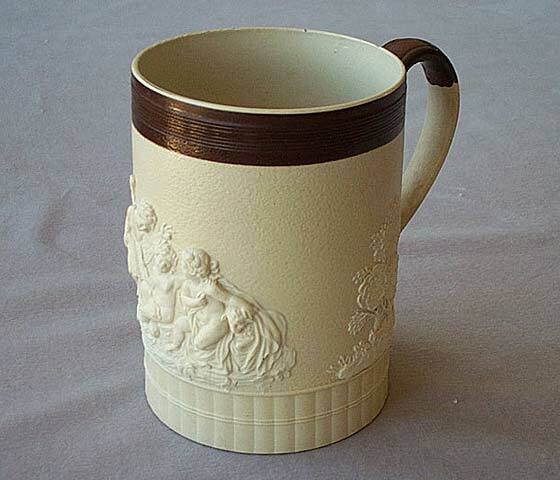 Price Code: B S2766: A stoneware childs mug with a light brown glaze and sprigged with a farmer on a horse , a windmill and a toper. The word Roy Gore from Granma printed in black.A greyhound moulded handle. 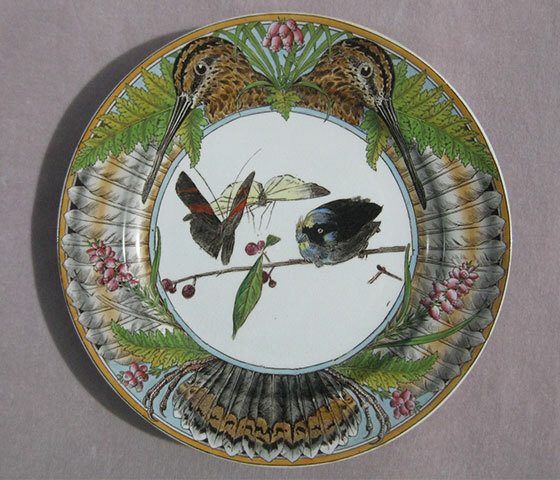 Price Code: C S2960: A Minton printed and enamelled earthenware plate from the “Game service” designed by William Stephen Coleman. 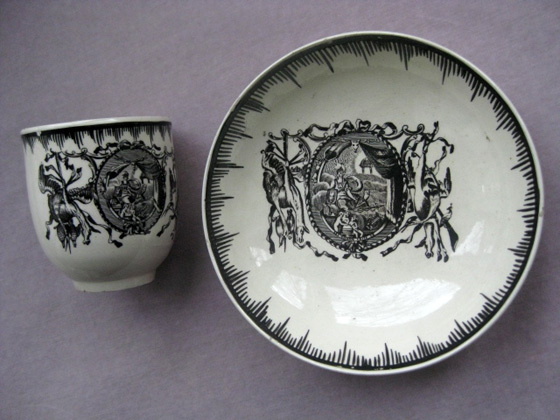 Impressed Minton’s and year cypher for 1880 Pattern C 2339. Reg Loz. S2783: A rare Leeds miniature creamware coffee pot simply decorated with gilt floral sprays and gilt rims and with a bifurcated strap handle and a flower and leaf finial. 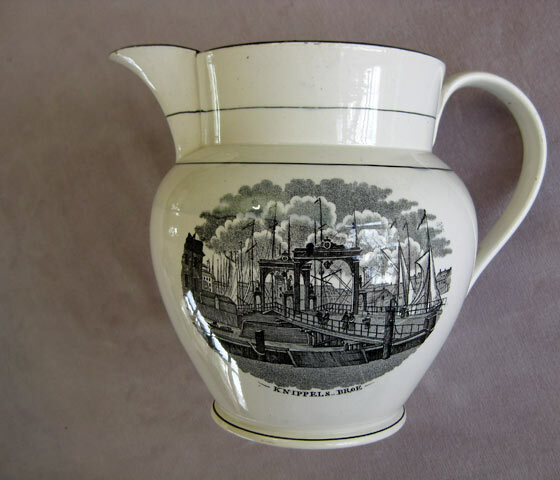 Price Code: C S2840: A creamware syrup drug pot with a round body with a short round spout and standing on a pedestal base. Circa 1900 length 1 7/8"
Price Guide : A S2922: A Victorian copper lustre jug with a band of blue to the middle and with relief moulded and painted birds and flowers. 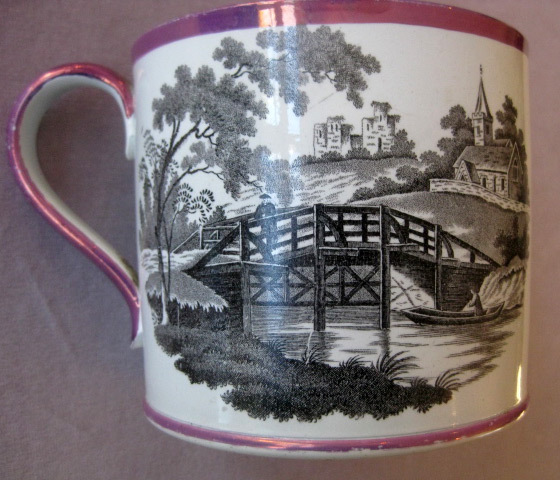 Unmarked Circa 1860 Height 6"
S2924: A pink lustre mug with lustre lined rim and base . The centre with relief moulded cherubs with a chariot and a goat and the front with relief moulded classical urn and flowers all on a blue ground. 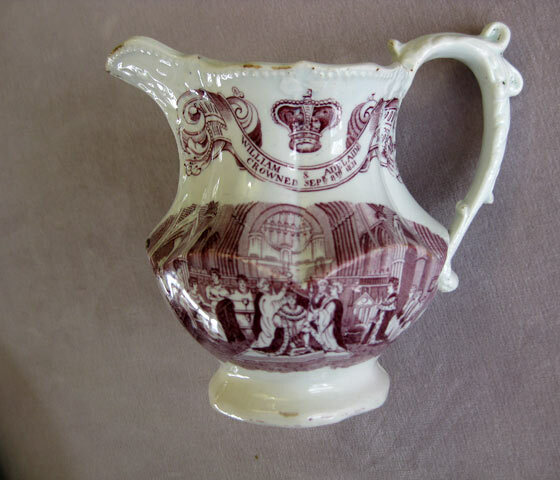 Unmarked Circa 1850 Height 3 3/4"
Price Guide A S2925: A small pink lustre jug the front painted and printed with the words “ Forget me not” within a floral wreath.